Restaurants come and go, but some are more popular and stick around for decades. Here’s a quick checklist of some local San Diego restaurants that have been in business for at least fifty years. How many have you patronized? Enjoy! (1931-2019) Pekin Cafe Chop Suey [scheduled to close Mar 2109], oldest surviving Chinese-American restaurant in San Diego. Great for takeout. Old-school egg foo yung. (1933) Las Cuatro Milpas, old homestyle Mexican cooking from the Estudillo family. Cash only. Pork (no beef) tacos for breakfast! (1928-2018) La Piñata [closed Nov 2018], originally founded by Florence Peters and family as Ramona’s Spanish Kitchen in 1932 to take advantage of tourists’ fascination with the story of Ramona (Nearby, Old Town’s Casa de Estudillo was renamed Ramona’s Marriage Place and heavily marketed as the venue from Helen Hunt Jackson’s period romance novel). The restaurant was taken over as La Piñata in 1962. (1933) The Waterfront Bar & Grill, San Diego fishermen’s hangout and longest continually held liquor license in town. Breakfast dishes and wide beer selection. (1934) Tobey’s 19th Hole Cafe, Balboa Park municipal golf course clubhouse coffee shop. 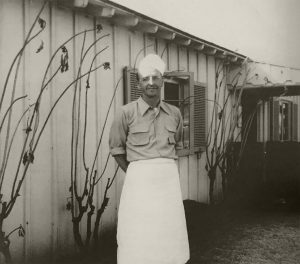 The restaurant concession was initially granted to golf pro Sterne Davis in 1934, then Chester and Lois Tobey, and since operated by the Tobey family — for three generations! A hidden gem, with tasty diner food and bubbly brunches. Update: Even though historically designated, the clubhouse is scheduled to be gutted and converted to a pro shop and offices. The City of San Diego’s Clubhouse Improvement Project dictates a new modern clubhouse and restaurant will be built adjacent to the ‘renovated’ clubhouse. Litigation has stalled the city’s efforts. (1935-2016) Red Sails Inn [Closed 31 Aug 2015], established by Joseph Y Viery at Fisherman’s Wharf and G Streets, this seafood eatery was originally adorned with a red sail. Okay. Not continually running since 1935 (it was closed for a few years), but reopened by Jack Allen Davis in the Shelter Island location in 1957. A favorite with local boaters. 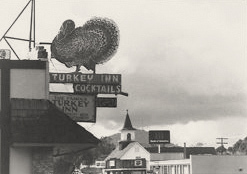 (1937) Turkey Inn, Homer Tucker’s longtime cafe and bar in Ramona was known for turkey dinners, as well it should. Ramona was once the epicenter of San Diego’s pre-war turkey farming industry. (1938) San Diego Chicken Pie Shop, serving inexpensive chicken dinners since the Great Depression. Chicken pot pie dinner (includes dessert). (1940) Café La Maze, old gambling hangout and key-club for Hollywood types, now a nostalgic steakhouse. Get a booth and order prime rib au jus. (1940) El Indio, traditional Mexican food, allegedly the originator of rolled tacos. Go for the taquitos, stay for the chips. (1941) Clayton’s Coffee Shop, popular Coronado counter service coffee shop where you’ll have to wait in line for a spot. Malted milkshakes rule. (1941) The Marine Room, originally built in 1916 as the Spindrift Inn. High-tide brunch gets exciting when ocean waves hit the windows. (1944) Hob Nob Hill, Harold and Dorothy Hoersch moved their original Juniper Café to the present location in 1946. Bakery. Breakfast. Almost bottomless mimosa. (1946) Anthony’s Fish Grotto, a San Diego family-run institution on the waterfront since 1946. La Mesa location still open! Crab Louie or Mama Ghio’s Cioppino. (1946) Barrett Junction Cafe & Mercantile, home of the world famous all-you-can-eat fish fry, and some mighty good barbecue too. Originally homesteaded in 1888, the mercantile was established in 1915. Now run by Chris and Leon Herzog. Hush puppies with honey. (1946) Pernicano’s Family Ristorante, founded by Vennero and Maria Pernicano and made famous by handlebar-mustachioed son George, this Italian-American chain is still operated by the family. Chicken Francesca or a la Baffi. (1946) Rainbow Oaks Cafe, originally founded in 1946 as ‘The Oaks.’ The historic eatery was bought by Jonell & Duke Maples in 2009 and remodeled using salvaged lumber from the 2007 fire. American home-style food, big portions is in order here! (1947) Aero Club, Mariam Profits’ iconic Middletown tavern for aircraft workers, now a classic whiskey joint (with more than 1200 kinds). Recently saved from obscurity by the owners of The Waterfront Bar & Grill. (1947) The Barbecue Pit, established by two sisters and their husbands, the chain of Texas-style barbecue joints is still run by the families. Joe & Lila Browning and Ed & Mella Jenson started out in the Maryland Hotel. Several locations have split off over the years as Wrangler Family Barbecue. (1948) Red Tracton’s, old school steakhouse and piano bar across from Del Mar racetrack. Originally from LA. Alaskan king crab legs, filet mignon. (1949) Harbor House, the bayside seafood house originally located on what was known in the 1940s as Fisherman’s Wharf. It was reopened in 1980 in Seaport Village which is slated for redevelopment. (1949) Rudford’s, was the quintessential San Diego 24-hour diner on Old Highway 80, now “The Boulevard.” Get a spot at the counter and a cup o’ joe. (1950) Filippi’s Pizza Grotto, Vincent and Madeline De Philippis family-owned pizzaria in Little Italy and several other locations. Pizzas are great, Lasagna’s a fave. (1950) Turf Supper Club, Golden Hill grill-your-own steakhouse and piano bar. Steaks are great (if you cook ’em right), pint-sized cocktails. (1951) Grant Grill, iconic restaurant in the U.S. Grant Hotel. Originally a men-only-for-lunch establishment, until stormed by a group of women attorneys in the 1970s. Look for the bronze plaque! Excellent food and beverage programs today, with live entertainment. (1951) Saska’s Steak and Seafood, the steak, seafood and sushi joint is considered a Mission Beach institution. Originally opened by Joseph Saska as Saska’s Hi-Tide Cafe, now owned by the Patio Restaurant Group. Crab chowder. (1953) Bali Hai Restaurant, Tom F Ham Jr’s classic Shelter Island tiki destination, originally called Christian’s Hut. Mai tais are very strong, ‘Goof Punch’ is just right. Buy a mug. (1954) Venice Pizza House, the LoMedico family’s pizza house, on more top-ten lists than we can count! (1955) La Bella Pizza Garden, Tony and Kitty Raso opened their pizzeria in 1955, and it’s still run by the family. (1955) Lido’s Italian Foods, family-owned for generations, Marco and Liz Simi’s traditional Italian restaurant is well-loved, with a consistently good menu. Go for the pizza, but partake of their famous appetizer served first – the salami, cheese and Cheez-It® cracker plate. (1956) Mona Lisa Italian Foods, Brunetto family restaurant and deli in Little Italy since 1973, originally located downtown San Diego. Explore their extensive deli, the sandwiches are great! (1957) 12th and Broadway Restaurant, inexpensive, Mexican-American diner located on the southeast corner of 12th (now park Blvd) and Broadway streets. For years Juan and Teresa Gonzalez’s cafe entrance was graced with one simple, hand-painted word — ‘Restaurant.’ Originally opened as Chick’s Coffee Shop by Juan Gonzales and Raymond Turnage. (1958) Napoleone’s Pizza House, Crivello family restaurant on National City’s old Mile of Bars. Singer Tom Waits worked there as a youth. (1959) Red Fox Steakhouse, steakhouse and piano bar attached to the Lafayette Hotel. One of the last to serve a garnish tray. Try a shrimp cocktail and steak. (c1960) Club Marina, Point Loma’s oldest dive bar, now under ownership of the Waterfront Bar & Grill. (1960) Nati’s Mexican Restaurant, founded in 1960 by Vernon E Lontz (who said he bought it from a woman named ‘Nati’, but the location was previously Dorothy Bales’ Consuelo’s, and he was its manager), now owned by Marilyn Thomas and Dennis Kerr, this longtime favorite has been serving up some of the same delicious Mexican recipes since the Eisenhower administration. (1961) Fidel’s Little Mexico, originally his barbershop, Fidel Montanez started selling tacos there, and the rest is history. Crab Burrito, Fidel’s Famous Margarita. (1961) Imperial House Continental Restaurant & Lounge, old-school Continental cuisine, Caesar salad, Steak Diane presented tableside a la minúte. Classic piano bar attached. (1962-2015) Albie’s Beef Inn [Closed Dec 2015], home of 1960s boudoir paintings and traditional piano bar. Prime rib and sweet carrot. (1963) Old Trieste, a time-capsule of a restaurant, serving the same menu of Italian food for years. Jacket required. Lobster Fra Diavalo, Calamari Fritti, Scampi Trieste, all great! (1963) Point Loma Seafoods, fresh seafood counter and takeout at the sportfishing docks. They’ll clean, filet and smoke your catch. Mrs Kelly’s Ceviche. (1964) Roberto’s Taco Shop, starting out with a tortillaria in San Ysidro, Roberto Robledo and sons have grown their family tree of ubiquitous taco shops to over 70 in the Southwest (not including all the *berto’s variations). Go for the carne asada burrito. (1965) Mister A’s, posh restaurant high atop Park West’s Fifth Avenue Financial Centre, was opened by San Diego businessman John Alessio. Remodeled by restaurateur Bertrand Hug in 2000. Dress code. A favorite outdoor rooftop happy hour for locals in-the-know. (1966) Wong’s Golden Palace, classic family-run Chinese eatery, celebrated its 50th anniversary February 28, 2016. Island of Flowers has been on the menu since day one. The Dragon Room bar serves tiki drinks, including their signature Wong Cup. (1967) Bully’s was founded in La Jolla in 1967 by George Bullington, JD Dahlen and Lester Holt. Today both the Del Mar (est 1969) and Mission Valley (est 1971) locations are known for strong cocktails, hearty steaks and great prime rib. Bullington is said to have invented the Keoke Coffee. (1967) Chiquitas Mexican Restaurant. Opened by Ray and Chela Rodriguez and still run by the family. Black angus carne asada, wild shrimp cocktails and margaritas. Yes please! (1967) Paesano Fine Italian Food. A classic, old-school Italian-American pizza joint on the 30th Street ‘craft beer corridor.’ Try the baked ravioli or lasagna. Kid-friendly! (1968) Roberto De Philippis Butcher Shop Restaurant, old-school steakhouse known for its loyal customers, generous cocktails, prime rib, Nebraska corn-fed beef and fishnet-legged waitresses. Founded in 1968 by Roberto De Philippis (Caruso’s, Roberto’s Pizza House, The Continental, Italian Village), son of Vincent and Madeline De Philippis (Filippi’s Pizza Grottos). Surviving location now operated by International Aero Club LLC (94th Aero Squadron). (1968) Su Casa, Marshall Pellar’s long-lasting Sonoran-style Mexican food and seafood grotto. In the same spot as The Luau, Mister Lucky’s Smorgette, and The Connoisseur restaurants. Pellar claimed to have invented the Strawberry Margarita and Nachos in 1968. Looks like I need to head south of the city to experience more! Enjoyed all but one and plan to visit the Balboa Park Golfers cafe soon. Couldn’t find the answer quickly online, but I think Yoshino’s on Washington qualifies. Were you thinking of the Marston Tea Room – or a place outside of the store? I know this does not count as a restaurant, but the Nite Owl in Pacific Beach has been there since the early 60’s as far as I know. I would love to see a list of oldest bars in San Diego next! Yes Dean, that’s a great place, and a great suggestion! how about mandarin house in la jolla ? opened in ’77 if that counts as old! i don’t see a page on here about bars. since you’ve got this great page about the oldest restaurants in san diego, can you make one about the oldest bars (including non-tiki ones) ? Recently hit the Red Fox Room adjacent to the Lafayette Hotel. It’s slated to move to a bungalow home across the street from where it sits now. Here’s the hiccup: There’s a battle brewing over who owns the wood paneled freeze interior of the RFR. The hotel says its their’s, and of course the restaurant wants to take it with them.